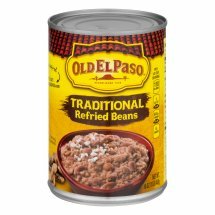 Excellent Source of FiberOld El Paso™ Refried Beans Traditional.Established 1938.Per 1/2 cup serving: 110 calories.1g sat fat, 5% DV.440mg sodium, 18% DV.0g sugars.Net wt 16 oz (1 lb) 453g. Cooked Pinto Beans, Water. Contains 2% or less of: Lard, Salt, Vinegar, Onion Powder, Hydrogenated Lard, Garlic Powder, Spice, Chili Pepper.